I would like to thank the following persons without whose guidance this dissertation could not have been completed. Who always guides me in every walk of my life? Secondly, I would like to express my sincere appreciation and gratitude to my supervisor Professor For his guidance and insight throughout in making my dissertation and especially, his invaluable suggestions and comments that really guided my research and also helped me to structure my dissertation. Thirdly I am also very indebted to my class fellows, my father and mother for their continuous support. I owe a lot of their unconditional love and understanding. Well, their suggestions allowed me to think in many different ways. Most importantly, they continually helped me improve my confidence. There were certain times, when I used to say that I just did not think I could go on with my studies, but they always knew just what to say to get me back in the race. They really very special entities of my life what a journey! I will never stop admiring them. I dedicated my work to my honorable parents and my respectable teachers, Prof. Whose efficient & magnificent devotion to my studies encourages me to achieve this. The intention of this study is to make sure the effect of human resource management practices like rewards and benefits, recruitment and selection, training and development as well as performance appraisal and their affects on employee performance and how employee performance affect organization performance. I used in this research positivism paradigm as I prepared a questionnaire which consist of 6 heads and each head has 5 questions and filled the questionnaire from 150 employees who are working in education sector. I study the variables rewards and benefits, recruitment and selection, training and development and employee performance as mediator and organization performance as dependent variable. For this research purpose my population is Punjab group of colleges, Superior group of colleges and Leads group of colleges. I used inferential analysis and put the data in Spss software and apply descriptive analysis as well as inferential analysis and write the findings and conclude the result as well as discuss the limitations and delimitations, implications and future research of the study of impact of human resource practices on organization performance in education sector. Human resource management practices is the management of people contained by the inner upbringing of organizations, cover the activities, policies, and practices involved in planning, obtaining, developing, utilizing, evaluating, maintaining, and retaining the appropriate numbers and skill mix of employees to achieve the organization’s objectives (Appelbaum, 2001). Human resource management considers important for business as to attain organization goal to improve its performance and development. Every organization, whether manufacturing or services, public or private, large or small, for-profit or not-for-profit must operate with and through other people. For the past 15 years, a growing consensus has been seen that organizational human resources, if effectively and efficiently managed, can create a source of sustained competitive advantage through human resource capabilities that are valuable, rare and imperfectly imitable; thus adding value to an organization’s performance (Wernerfelt, 1984; Barney, 1991; Grant, 1991; Mahoney and Pandian, 1992; Huselid, 1995). Therefore human resource has become the most important of all resources across every type of organization all over the world and particularly in the context of the educational sector in developing countries such as Pakistan (which is now considered to be the sixth largest populated country in the world, WPP, 2009). This is because academic institutions, particularly universities, are responsible for the development of the intellectual acumen of a nation’s human resource. Furthermore, quality of education is considered as one of the major factors that accelerate the development of a country and is the most important instrument in achieving the desired stage of economic development (Economic Survey of Pakistan, 2005). To achieve this level, the performance of teachers is the key feature of human resource factor. According to Delaney and Huselid (1996), empirically suggested that fair rewards, competence development, empowerment, recognition and information sharing all affect organizational commitment. Although several studies have been conducted about organizational commitment, ambiguity still exists about the factors affecting the development and promotion of it (Beck & Wilson, 2001). The leaders of higher education are of the view that the central functions of higher education i.e. educating people, conducting research and providing community services must be well-maintained, reinforced and expanded. In this regard, universities are those places where knowledge and skills are not only transferred to young generation transforming them into productive and responsible citizens (Gordon and Whitchurch, 2007) but also created. According to Khan (2010), exposed that in energetic business impression, there is a need of an approach to achieve better performance, to originate and implement HRM practices. In substantial and slight extent the education service organizations need to invest in such practices to get a competitive advantage. Job satisfaction is a crucial indicator of how employees feel about their job and describes how much they are contented with his or her job. The satisfaction level of employees also associated with increase output of the organization. Job satisfaction of an employee is essential to the success of an organization. In an organization a high rate of employee contentedness is directly related to a lower turnover rate. Thus, keeping employees’ satisfaction in their jobs with their careers should be a foremost priority for every organization. According to Bogdanova et al (2008), stated that HRM practices try to develop and allocate human capital in the best possible ways in order to achieve long-term goals; they provide them with many benefits and good environments that would boost employee’s motivation, job satisfaction, and increase their performance. Although as a developing country, educational system of Pakistan is still facing many problems yet a tremendous growth is seen in Higher Education Institutions over last decade due to constant efforts by HEC; an autonomous body which is responsible for allocating funds to Universities, accrediting degree programs and prescribing the guidelines under which all institutions of higher education may operate. Realistically, it is accepted that the organizations with good human resource practices can usually satisfy or fulfill the needs of employees and turn them into more committed personnel of the organization (Slattery & Selvarajan, 2005). Human Resources Management plays vital role and are critical to the realization of the goal that universities must attract, develop and maintain an energetic workforce to secure their strategic position (Olufemi, 2009). This can be done by identifying those specific HR practices that can prove a hallmark in improving the performance of teachers (Darling-Hammond &Youngs, 2002). Therefore, there is a strong need to conduct research and highlight the kinds of human resource practices that are viable for HEIs of developing countries particularly Pakistan. In an attempt to explore this linking process, many researchers propose that HR practices are not necessarily directed towards a firm’s performance but they influence employees’ competence and behavior which eventually lead to performance (Delery, 1998; Ferris et al., 1998; Wright et al., 1994). Researchers have presented different models that encompass different levels and types of mediating effects in HR practices. Different HR practices are tested by researchers to get optimal performance outcomes from faculty in higher education institutions as well. However research on HRM in higher education is confined to developed countries only. Very few studies in the context of higher education institutions of developing countries are found that explore the impact of HRM on the overall performance and development of institutions (Olufemi, 2009; Ahmad et al, 2010; Joarder & Sharif, 2011) while none of them have explored the impact of selected set of HR practices directly on employee performance. On the basis of the above discussion, this study aims to research and highlight the kinds of human resource practices that are feasible for developing countries such as Pakistan, with special reference to the educational sector in order to make their universities rank amongst the top universities of the world. In consideration of the above issues, this research is meant to explore the relationship between HRM and performance in the context of an Eastern developing country (Pakistan), with particular reference to teachers’ performance in higher educational sector. This study has made significant theoretical and practical contributions as a considerable research work has used resource-based-view and social exchange theory as a theoretical framework to explore the relationship between HRM practices and performance. This study is very helpful in the development of conceptual model to measure the effect of HRM practices on individual performance for the educational sector. The present study put in to the literature of HRM and performance by examining the applicability of Western concepts and theories to an Eastern developing country (Pakistan).This study is useful for managers in the education sector to come up with policies that help them to attract and retain their top-level faculty at their respective universities. This research is highly valuable for both academicians and practitioners. To determine the relationship between recruitment and selection and employee’s performance. To determine the relationship between training and development and employee’s performance. To determine the relationship between performance management system and employee’s performance. To determine the relationship between compensation and reward and employee’s performance. To determine the relationship between employee’s performance and organizational performance. What is the impact of human resource practices on the organization performance in higher education Sector? To what extent HR practices affect employee’s performance in an organization? To what extent employee’s performance lead to organizational performance? Does employee’s performance of teachers mediate the relationship between HR practices and organizational performance? H1 = There is relationship between recruitment & selection and employee’s performance. Ho = There is no relationship between recruitment & selection and employee’s performance. H2 = There is relationship between training & development and employee’s performance. Ho = There is no relationship between training & development and employee’s performance. H3 = There is relationship between performance management system and employee’s performance. Ho = There is no relationship between performance management system and employee’s performance. H4 = There is relationship between compensation & reward and employee’s performance. Ho = There is no relationship between compensation & reward and employee’s performance. H5 = There is relationship between employee’s performance and organizational performance. Ho = There is no relationship between employee’s performance and organizational performance. There are four independent variable of my research and four variables are recruitment and selection which is consider very important in analyzing that we put the right person with right skill at right place and a good employee enhance the productivity it is a very important function of human resource management practice. According to Daniel & Metcalf (2001), recruitment is part of the over-all management function of staffing that serves a major role player in ensuring that company strategies will be implemented. Spencer (2004) also emphasized that staffing requires both the process of attracting and selecting prospective personnel’s capabilities and competencies with the company position. It is perhaps the most important function because it is the starting point in the whole HR process. Its importance is noted by Drucker (1992) as he said that “every organization is in competition for its most essential resource: qualified, knowledgeable people” (Drucker 1992). Recruitment is defined as the process of discovering, developing, seeking and attracting individuals to fill actual and/or anticipated job vacancies (Sims 2002). It has three general purposes: to fulfill job vacancies; to acquire new skills; and to allow organizational growth. There are several factors which influence recruiting efforts namely: organizational reputation, attractiveness of the job, cost of recruiting, recruiting goals and recruiting philosophy (Sims 2002). Selection is the partner of recruitment in HR planning. It is a critical process for the organization because good selection decisions ensure the company of their financial investments in their employees (Dean & Snell, 1993). Recruitment and selection has an important role to play in ensuring worker performance and positive organizational outcomes. It is often claimed that selection of workers occurs not just to replace departing employees or add to a workforce but rather aims to put in place workers who can perform at a high level and demonstrate commitment (Ballentyne, 2009). Accurate employee selection decisions have never been more important to organizational success. Organizations need quality staff that can operate in an environment of increasing complexity and change. Also, in a business environment where intellectual capital increasingly represents an organization’s currency of trade, it is people that create and sustain an organization’s competitive advantage. Hiring the wrong person for the job can be costly. The time and expenses associated with advertising, agency fees, interviewing candidates and the negative long term financial and non-financial implications of hiring the wrong person make finding and hiring the right person critical. Traditionally, organizations have focused on identifying and selecting people based on their skills and experience. It makes sense if one can find person who has the right set of skills and has done a similar job. There is a good chance that they will be able to perform effectively in a new role. Though skills and experience continue to be important, practice however pointed to motivational fit as a key differentiator in the selection process. According to Chartman (2001), defines motivational fit in two distinct ways, i.e. job fit motivation and organization fit motivation. Job fit motivation is the degree to which the activities and responsibilities of a particular job are consistent with the activities and responsibilities that an individual finds personally satisfying while organization fit motivation is the individual’s compatibility with an organization’s values and mode of operation. Organizational fit covers a range of organizational attributes which is the most common and frequently cited element that centers on the congruence between individual and organizational values. It is also called ‘culture fit’. While these two constructs play important roles in making effective hiring decisions. According to Cable and Judge, (1996) believe organizational fit increasingly represents the key. Most times, organizations fail to consider motivational fit and in particular organizational fit. However, as a result of increasing complexity, change and employee demands, information about organizational fit can help organizations make better hiring decisions.Numerous research results illustrate the importance of the congruence between the values of the individual and the values and culture of the organization. The importance of recruiting for culture fit cannot be overemphasized because of its impact on making good recruitment decisions is supported by the impact of poor culture fit decisions. It helps to reduce absenteeism and turnover. Also, assessing for fit helps the organizations increase employee satisfaction and morale, which leads to better performance and productivity. Motivated employees are more likely to take charge of their own performance, seek ways to improve processes, products and services and contribute positively to their organization’s bottom line success. Because job dissatisfaction is the leading cause of voluntary turnover and is directly linked to lower productivity and morale, it makes sense to consider and assess for fit during the recruitment process. Thus, the importance of values and values integration throughout the recruitment process is imminent. According to Dessler (2005) defines compensation as all forms of payments or rewards given to employees which arise from their employment. Compensation can be divided in to various parts. One way is to break it down into three parts namely, Fixed-Pay, Flexible Pay and Benefits (Beard, 1986). The other way is to divide Compensation into two parts, Performance-based pay and Non-performance based pay (Taylor, F.1911). Legally required benefit programs include social security, workers compensation while discretional programs include health benefits, pension plans, paid time off, tuition reimbursement, recognition award, foreign service premiums, responsibility allowance, child care, on campus accommodation, promotion, annual increment and a host of others ( Cascio, 2003; Dessler, 2005; Bernadin,2007). A Similarly employee’s job satisfaction leads to customer satisfaction which leads to organizational success. Motivation can be seen as an inner force that drives individuals to attain personal and organization goals (Hoskinson, Porter, & Wrench, p.133). Motivating factors are those aspects of the job that make people want to perform, and provide people with satisfaction, for example achievement in work, recognition, promotion opportunities. These motivating factors are considered to be intrinsic to the job, or the work carried out. Hygiene factors include aspects of the working environment such as pay, company policies, supervisory practices, and other working conditions. While Hertzberg’s model has stimulated much research, researchers have been unable to reliably empirically prove the model, with Hackman & Oldham suggesting that Hertzberg’s original formulation of the model may have been a methodological artifact. Furthermore, the theory does not consider individual differences, conversely predicting all employees will react in an identical manner to changes in motivating/hygiene factors. Finally, the model has been criticized in that it does not specify how motivating/hygiene factors are to be measured (Hoskinson, Porter, & Wrench, p.133). According to Sohrab Ahmad and Khurram Shezad (2011), did a study on the impact of compensation, promotion and performance evaluation practices on the performance of university teachers of Azad Jammu and Kashmir. Authors concluded that compensation has strong and positive impact on performance of university teachers of AJK. Compensation is the major element to influence teachers. The more teachers are compensated fairly the more they will perform better. On the other hand the performance evaluation and promotion practices were insignificant with the performance of university teachers of AJK. The reason for this is most promotion and performance evaluation procedures are vague and not properly practiced. According to Shezad et al. (2008), did a study on impact HRM practices on perceived performance of university teachers of Pakistan. It was hypothesized that compensation, promotion and performance evaluation practices are significantly and positively related to perceived performance of university teachers of Pakistan. Compensation and promotion practices were found to be significantly correlated with perceived performance of university teachers of Pakistan. Performance evaluation practice was found to be insignificantly correlated with the performance of university teachers of Pakistan.According to Milkovich & Newman (1999) “compensation refers to all forms of financial returns and tangible services and benefits employees receive as part of employment relationship. Many researchers revealed the importance of compensation in motivating employees. Bohlander, Snell and Sherman (2001) narrated that compensation benefits have great importance in human resource management by providing reward to their employees against their efforts. According to Sansone and Hareckiewicz (2000), identified that compensation benefits are very effective to energize and guide employees in achieving their desired goals. Milkovichand & Newman (2002) and Stone (1982) indicated that money can be used to motivate employees for different reasons. One can be motivated by providing them basic necessities of life. According to Daniel and Metcalf (2003) High-performance companies understand the importance of offering awards and incentives that gives effective and outstanding work. It has great importance to motivate and is effective methods of reinforcing company expectations and goals. According to a test by Grinstein et al, (2004), bonuses are mainly motivated by an increase in company size and the annual revenues followed by the CEOs performance and talent. Bonuses is a type of compensation constituting rewards, supplements, dividends or/and a sort of discount. It is an incentive to the company management and to retain employees when goals are accomplished (Ne.se). From a company’s perspective it is considered attractive to create a link between company performance/results through restricting the fixed wage and allowing the company results to influence the actual wage. Since a salary system with fixed and variable compensation without restrictions causes problems, a high share of variable compensation usually leads to mediocre results from the company’s view (Smitt, 2002).Compensation has been researched from different perspectives at home and abroad. Rab (1991), in a study on 24 small enterprises operating in Dhaka, identified that most of the enterprises (87.5%) paid one or more types of allowances in addition to salary. He found that nearly 7% enterprises paid festival bonus, 20% paid medical allowance, and 20% provided pay increment. According to Statt (1994) argues that the modern work physical environment is characterized by technology computers and machines as well as general furniture and furnishings. To achieve high levels of employee productivity, organizations must ensure that the physical environment is conducive to organizational needs facilitating interaction and privacy, formality and informality, functionality and cross-disciplinarily. Consequently, the physical environment is a tool that can be leveraged both to improve business results (Mohr, 1996) and employee well-being (Huang, Robertson and Chang, 2004). In general, when people get satisfied with their work, they tend to feeling of positive attitude related to their jobs. Their minds are convinced that, other work/ jobs would not prove better than the existing one. Therefore, it is not likely that they would switch their jobs. Employees desire to stay with their company and strive hard in their job. Further to this, in order to retain their existing satisfied jobs, employees would exert more and work effectively, that is valuable for the company. Therefore, for the purpose of increasing employees’ commitment level, the managers may try to enhance their employees’ job satisfaction level (Côté and P. Heslin, 2003). It is very necessary for the organization to design the training very carefully (Michael Armstrong, 2000). The design of the training should be according to the needs of the employees (Ginsberg, 1997). Those organizations which develop a good training design according to the need of the employees as well as to the organization always get good results (Partlow, 1996; Tihanyi et al., 2000; Boudreau et al., 2001). It seems that Training design plays a very vital role in the employee as well as organizational performance. a bad training design is nothing but the loss of time and money (Tsaur and Lin, 2004). On the job training helps employees to get the knowledge of their job in a better way (Deming, 1982). People learn from their practical experience much better as compare to bookish knowledge. 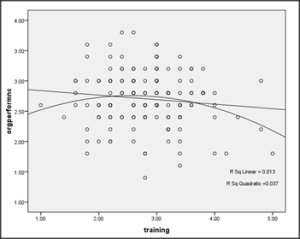 On the job training reduces cost and saves time (Flynn et al., 1995; Kaynak, 2003; Heras, 2006). It is better for the organizations to give their employees on the job training because it is cost effective and time saving (Ruth Taylor et al., 2004). It is good for organization to give their employees on the job training so that their employees learnt in a practical way (Tom Baum et al., 2007).Training and development helps in creating a better corporate image, thus aid in organizational development, i.e. organization gets more effective in decision making and problem solving which helps in understanding and carrying out organizational policies. Training and development demonstrates a commitment to keeping employees on the cutting edge of knowledge and practice. Creativity and innovation also trigger the performance of employees and facilitated by organizational culture which training and development programs provide. According to Tushman and O’Reilly (2002), stated that organizational culture lies at the heart of organizational norms that reflects the influence of organizational culture on creativity and innovation. It also plays an important role in creating such an environment that enables learning and innovative response to challenges, competitive threats or new opportunities. Thus, creating and influencing an adaptive culture is one of a manager’s most important jobs and which training and development programs avail the opportunities (Daft, 2010). Precise information and applicable knowledge usually made available via training and development always assist performance, whereas erroneous information and irrational knowledge are likely to do the opposite, (Feldman and March, 1991; Daft and Weick, 1994). Not only that, cultures provide cognitive frameworks through which people interpret what they observe and experience and provide language and referents to use in communicating with others, (Wilkins and Ouchi, 2003)..
Culture through the different training and development activities contribute schemas and scripts that can affect performance by providing preexisting ways of understanding what is occurring, how to evaluate it and what sequences of actions are appropriate to the situation (Lord and Foti, 1996). According to Siegal and Sussman (2003), asserted gaining competitive advantage which surrounds knowledge adoption and helps to integrate the organizational culture and social presence can actually explain information sharing process which comes via training and development programs. Thus, we come up with the proposition. There is a direct relation between customer satisfaction and employee satisfaction. The relation between employee satisfaction and financial performance may not be found because it is mediated by customer satisfaction. In service industry, customer satisfaction is the key to success. Employee satisfaction plays a considerable role in enhancing the firm profitability and improving operational performance of organizations and quality of goods and services in Pakistan. There is no doubt in it that employee satisfaction is critical to attain quality and profitability in service industry especially (Côté and P. Heslin, 2003). Employee empowerment is also an effective way of satisfying them. When employees are given employee empowerment, then it leads to job satisfaction. Employee empowerment also causes customer satisfaction. Performance appraisal takes into account the past performance of the employees and focuses on the improvement of the future performance of the employees. It gives the staff the opportunity to express their ideas and expectations for the strategic goals of the company (Mullins, 1999). Employees can find what is expected from them and what the consequences of their performance are. Ideally they receive a fair and analytical feedback for their performance (Derven, 1990). Performance appraisal helps to rate the performance of the employees and evaluate their contribution towards the organizational goals. It helps to align the individual performances with the organizational goals and also review employees’ performances. Besides, enhancing motivation appraisal is about involvement in the ‘big picture’ – responsibility, encouragement, recognition for effective delivery and effort (Malcolm and Jackson, 2002). Performance Appraisal is a motivation for the employee, who performs well in the present to go on doing so and in the future (Derven, 1990). Many HR practices could be experienced to check the performance of the employees in an organization. Teseema and Soeters, (2006) took eight HR practices to check their relationship with perceived employee performance. The HR practices used by Teseema and Soeters, (2006) was recruitment and selection practices, compensation practices, placement practices, performance evaluation, training practices, practices, employee grievance procedures, promotion practices, and employee social security. Shahzad, Bashir & Ramay (2008) conducted the study to test the impact of HR practices on employee performance among university teachers of Pakistan. According to Shahzad, Bashir & Ramay (2008) had chosen the three main HR practices which were Performance evaluation practices, Compensation practices, and Promotion practices to check their relationship with employee performance. The present study selected the one HR practices that are Performance Appraisal practices. Because banking sector of Pakistan uses this HRM practices to influence employee performance. Performance appraisal practices are the tools used by the organizations to motivate the employees and influence their performance so that they would be able to contribute to the organizational profitability. This study also argued that Performance evaluation practices also affect the performance of an employee in an organization. It is argued that if the employees are satisfied with their performance rating then they will perform even better. Performance evaluation is the part of performance management which concern with performance of employees. Performance evaluation can be defined as the procedure to evaluate the past and current performance of an employee related to the performance standards (Dessler, G). In other words, Performance appraisal is the procedure through which an organization measures the total input of employee to the organization during a specific period of time. During the last decade, there has been a growing understanding of the requirements of improved performance and quality within the total building process, which has toned the development and successive recognition of quality assurance in building works. The viewpoint of performance enhancement in total quality management has acknowledged that measurement in the design, procurement, and construction process is important (Glagola, Ledbetter, & Stevens, 1992). Motivation of an employee is useful to practice extra assurance; In addition, the recreation of these objectives will also develop the perspective that existing employees will be considered first when positions become available. This method hugely motivates the employees and also makes the recruitment process easy for future concerns (Barr, 1993). Employees should be given opportunity to energetically participate in evaluation process along with supervisor at adult to adult level. Employee restores his or her interest in being a part of the organization now and in the future. Training needs are identified to improve the quality of work. So when employee’s takes part in appraisal process they feel that they are important for the organization and organization is serious for them. Supervisors also feel easiness in appraising the performance of employees. (Randi, Toler, Sachs, 1992).In this era of quickly changing economic environment, characterized by such phenomena as the globalization and deregulation of market, changing customer and investor demand, and ever increasing product –market competition the role of human resource can be crucial (Becker & Gerhart, 1996; Arthur, 1994; Cutcher). Recent researches argued that the HR practices that signal investment in employees and carry a notion of care for them are significantly related to the performance, though this relationship is mediated. Some scholars who subscribe to this difference position claim that women have a different, “female voice” (Gilligan, 1982) that has been overlooked by mainstream theory and research (e.g., Hare, 1997 Kibbe Reed, 1996). On the other hand, a significant part of the social science literature favors the similarity position, claiming that, all things considered (or controlled for), male and female direct in similar ways (Dobbins & Platz, 1986; Klenke).When the best method for evaluation is chosen, the following considerations should be taken into account: the accuracy and authentication of the criteria, appropriateness for the specified criteria, appropriateness for the given group of employees and the cost of the process – (how much time and money would be needed for the execution of the process). Appraisal methods are discussed by Armstrong (1996), The method also must be simple and easily understandable for all people in the organization. Characteristics of the work, employees and the type of the organization have an influence on the way of determining the best method. In the situations, where there is a more routine work and more stable environment and the worker has no much space to show creativity and in-dependency, the best methods are based on comparing with labor standards and rating scales. In recent years many organizations have been busy in implementing new or improved performance management systems. Recent research shows that the regular use of these systems leads to better organizational results (Ahn, 2001; Ittner et al., 2003). There is however little knowledge about the actual mechanisms which cause the positive effects of performance management (Bourne et al., 2000; Bourne et al., 2005). This might be because a lot of research has gone into the design and implementation of a performance management system and into the effects performance management has on high organizational results or performance (see a.o. Schiemann and Lingle, 1999; Waal, 2002b; Stratton et al., 2005). There is however a scarcity of empirical case study works at organizations into the actual workings of performance management and the factors which actually cause the positive effects. Fortunately this issue has gotten more attention these past years and researchers are increasingly focusing on the factors which cause performance management to work (Malina and Selto 2000). According to Tahir Masood Qureshi et al. (2010), did an empirical study on the impact of HRM practices on financial performance of banks which were selection, training, performance appraisal System, compensation system, career planning system and employee participation. All the practices were positively related to financial performance. But selection training, compensation and employee participation have stronger influence on financial performance of banks. To obtain organizational fitness, an organization needs a clear and explicit performance management concept which is formulated by its most senior management (Bossert, 1993). This performance management concept is the basis for long-term development of the organizational strategy and the strategic objectives. According to Evans (2010), employee engagement is key driving performance in organization to achieve good performance and retention. Employee engagement depends on organizational structure, the system of work and quality of leadership and communication skill, performance management. Employee empowerment is also an effective way of satisfying them. When employees are given employee empowerment, then it leads to job satisfaction. Employee empowerment also causes customer satisfaction. Similarly employee’s job satisfaction leads to customer satisfaction which leads to organizational success. In general, when people get satisfied with their work by performing better, they tend to feeling of positive attitude related to their jobs. Their minds are convinced that, other work/ jobs would not prove better than the existing one. Therefore, it is not likely that they would switch their jobs. Employees desire to stay with their company and strive hard in their job. Further to this, in order to retain their existing satisfied jobs, employees would exert more and work effectively, that is valuable for the company. Therefore, for the purpose of increasing employees’ commitment level, the managers may try to enhance their employees’ job satisfaction level (Côté and P. Heslin, 2003). We selected variables after the detail study of different articles written by different authors or writers. I myself did not generate my variables. Positivism research paradigm is well known and is used in universities internationally. This research paradigm strives to investigate, confirm and calculate law, like pattern of behavior, and is commonly used in graduate research to test theories or hypotheses. This is particularly useful where very large sample sizes are involved. Normally its focus is on the objectivity of the research process (Creswell, 2008). The positivist paradigm mostly involves quantitative methodology, utilizing experimental methods involving experimental and control groups and administration of pre- tests and post-tests to measure expand scores. There are two types of paradigm these are as under. This research paradigm use simple observational skill to understand things. For example, to decide whether or not it is clear outside, you look out the window. If you see sun, then it is sunny. A statement in this paradigm is that everyone experiences and observes the world in the same way if your neighbor looks outside, they will also observe that it is sunny. These truths about the world are reliable even when we are not observing them. This paradigm, related to post-positivism, is often utilized in qualitative research and stresses the importance of understanding each individual’s perception of reality. Research must include how individuals experience the world, and each of these experiences is considered valid truths. Critical humanism is a sub-type of this paradigm that involves including the persons studied in the research process. We adopt positivism in Pakistan constant. Data was collected from major city of Pakistan which is Lahore. Data was collected by distribution of 150 questionnaires. These questioners were distributed on 15 and 16 May 2013. All 150 questionnaires were used for further analysis. But secondary data is collected from internet about sector and previous studies on human resource practices. Data analysis is the process of organizing, summarizing, presenting, interpreting, and drawing conclusions based on the data with the goal of highlighting useful information and supporting decision making. In quantitative research data analysis are used objectively by using statistical techniques. Descriptive analysis is statistics that are used to understand and describe the data. Descriptive analyses are used to answer the descriptive type of research questions. A frequency table or frequency distribution is calculation of the numbers of time each category on a single variable is marked by the respondent. A frequency can be further classified by expressing the total results in the form of percentage. Bar charts are also called graphs. A bar chart for comparing the means of groups of observers. (kinnear & gray, 2006)The diagrammatically representation of data is called Bar Charts. Bar charts are usually used to express qualitative data. Five figure summaries are used to obtain the simple numerical summaries of the numerical values of the variables. 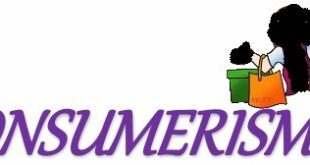 If the data is converted into numerical order then the results of five figure summary can be extracted. There are five different figures that are explained below. Minimum Value: The smallest value of the data. Maximum Value: The largest value of the data. Median: The middle value of the data. Lower Quartile: The middle value of the first half. Upper Quartile: The middle value of the second half. Inferential analysis are most useful for the purpose of getting the conclusion from the about a population from the sample. The conclusions are derived on the basis of statistical relationships. Inferential analyses are used to differentiate the two or more variables on the basis of statistical tests with the assumption that the sample is selected on the random basis. This work is done for the purpose to generalize or for the purpose of make predictions in future. We turn to two statistics which were designed for the purpose of measuring the strength of a basically linear association between two continuous variable X and Y. (kinnear & gray, 2006). Pearson correlation are used when two variables are exists and these values are in the form of normal/scale. The main assumption of the Pearson correlation is the variables that are used must be linear. Regression analysis is frequently used to analyze data from unplanned experiments, such as might arise from observations of uncontrolled phenomena or historical records. Regression analysis is also highly useful in designed experiments. Generally, the analysis of variance in a design experiment helps to identify relating the important factors to the response (Montgomery). I collected the data which is easily reachable for me and the collected data is use only for research purpose. The data collected will be kept confidential. The data which is collected for research purpose not altered by me. The collected data will be remained official and not leaked out. The data which is collected are used same as it is collected. I collect the data to enhance my knowledge related to my study. Data was collected for increase my analytical skills. The data which I collect from different sources would not be misused for any other purpose. Data collected was legal, comprehensive and relevant to the subject. Data collection does not include any act of misrepresentation, fraud and coercion. There are too many variables but select only six. There are many sources to collect data but I used primary source of data collection. I used data of 150 people taken from questioner. From above table, from the profile information, within the sample of 150 respondents, the percentages for gender are 7.1 % of male respondents and 41.0 % female respondents. Most of the respondents were from age group below 25 and they were 40.4% 26 to 35 years old were 4.5%. Most of respondents were from age group 36 to 45 years old 2.9% and remaining were from the age group 46 and above 0.3 % out of 150 items from conducting survey 150 items from conducting survey and it is valid percentage and have no missing value. most of respondents from bachelors, masters, M.Phill and their percentages were 10.3%, 34.0% and 3.8% as well as most of respondents were from designation of entry level, middle level and upper level and their percentages were 15.1%, 5.8% and 27.2% out of 150 items from conducting survey 150 items from conducting survey and it is valid percentage. 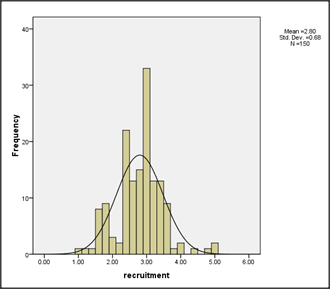 This is histogram of recruitment which has data of 150 questionnaires and it is normally distributed. In this graph our mean is 2.80 and standard deviation is 0.68 and bell curved shows that data is normally distributed. 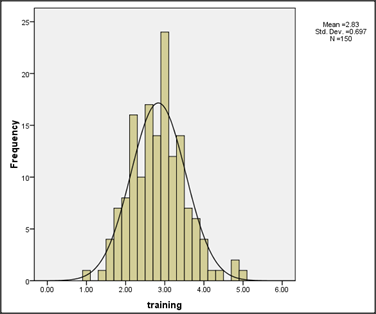 This is histogram of training which has data of 150 questionnaires and it is normally distributed. In this graph our mean is 2.83 and standard deviation is 0.697 and bell curved shows that data is normally distributed. 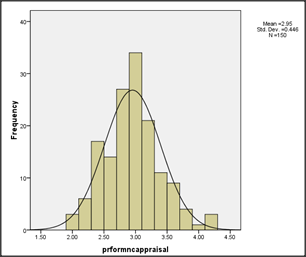 This is histogram of performance Appraisal which has data of 150 questionnaires and it is normally distributed. 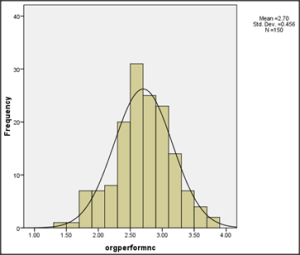 In this graph our mean is 2.95 and standard deviation is 0.445 and bell curved shows that data is normally distributed. 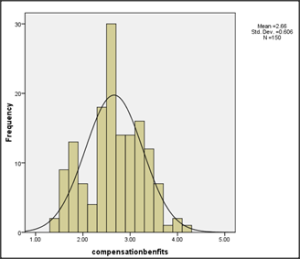 This is histogram of compensation and benefits which has data of 150 questionnaires and it is normally distributed. In this graph our mean is 2.66 and standard deviation is 0.606 and bell curved shows that data is normally distributed. This is histogram of employee performance which has data of 150 questionnaires and it is not normally distributed. In this graph our mean is 2.69and standard deviation is 0.421 and bell curved shows that data is not normally distributed. This is histogram of Organization performance which has data of 150 questionnaires and it is not normally distributed. In this graph our mean is 2.70 and standard deviation is 0.456 and bell curved shows that data is not normally distributed. In fig.2 scatter plot shows the relationship between two scale variable recruitment and organization performance and the difference between linear and Quadratic is 8.908which shows that, there is a non linear relationship between recruitment and organization performance. 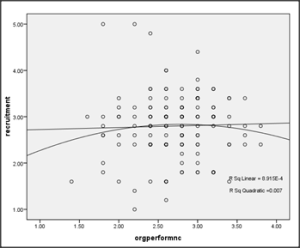 First presentation of correlation shows the relationship between two scale variable recruitment and organization performance and the Spearman’s test is calculated because these variable have non liner relationship between each other, r = .065 which shows the positive relation between recruitment and organization performance and the sig. is .432 which was greater than 0.05 shows and there is a week relation between them. 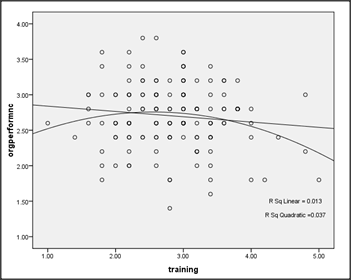 Second presentation of correlation shows the relationship between two scale variable training and organization performance and the spearman’s test is calculated because these variable have non liner relationship between each other, r = – .068 which shows the negative relation between training and organization performance and the sig. is .406 which was greater than 0.05 shows and there is a week relation between them. 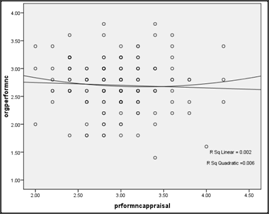 Third presentation of correlation shows the relationship between two scale variable Performance Appraisal and organization performance and the Pearson’s test is calculated because these variable have liner relationship between each other, r = – .047 which shows the negative relation between Performance Appraisal and organization performance and the sig. is .569 which was greater than 0.05 shows and there is a week relation between them. 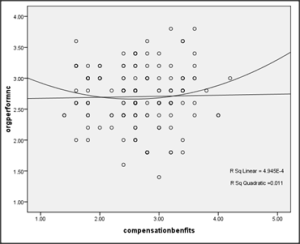 Forth presentation of correlation shows the relationship between two scale variable compensation and benefits and organization performance and the spearman’s test is calculated because these variable have non liner relationship between each other, r = .025 which shows the positive relation between compensation and benefits and organization performance and the sig. is .765 which was greater than 0.05 shows and there is a week relation between them. 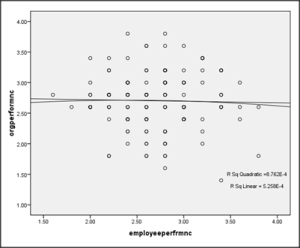 Fifth presentation of correlation shows the relationship between two scale variable employee performance and organization performance and the spearman’s test is calculated because these variable have non liner relationship between each other, r = .003 which shows the positive relation between employee performance and organization performance and the sig. is .965 which was greater than 0.05 shows and there is a moderate relation between them. Concurrently multiple regression was conducted to examine the best predictors of impact of human resource management practices on organization performance in education sector. The means and standard deviation and inter correlations can be instigate in the table. The combine of variables to predict impact of human resource management practices on organization performance in education sector were statistically considerable because p<0.05. The beta coefficients are presented in the last table. The adjusted R square value was -.102 Impacts of human resource management practices on organization performance in education sector was explained by the model and it has negative effect. Specifically, the crucial factor in the HRM-performance relationship is how HRM policies shape discretionary behavior, i.e., the choices people often make about the way their work is done, which are neither expected nor required, and therefore cannot officially rewarded or punished by the organization for their presence or absence, which is translated into improved organizational performance (Purcel et al. 2003). The basic purpose of this chapter explain the overall research study in this chapter explain HR practices on employee performance in education sector of Pakistan. I select variable in this study recruitment and selection, reward, training and development, performance appraisal, employee performance and organization performance. Firstly, I identify the problem statement that in this era the competition has been increased and people wants more reward and training to performed better and better. I check my variables with the different articles of researchers and then make my study. After identifying the problem statement I select these variables and make the literature upon these variables and some others. On these constructs I select these six variables for my study. The literature shows the authenticity of my constructs. I take the sample of 150 employee of education sector. AMO theory is regarded to be the heart of strategic human resources management in the sense that organizations looking for improving performance develop HRM policies in the domains of resourcing and development, compensation and incentives, and involvement and job design that are designated to positively shape discretionary behavior (Boxall & Purcell, 2003; Lepak et al., 2006). After purification of the variables I select four independent variable Recruitment and Selection, training and development, performance appraisal and compensation and benefits and employee performance as mediator and organization performance as dependent variable. I used to make the data collection process in which tools for data collection was recognized. We used the questionnaire technique for the data collection and the targeted population was employees of education sector and the methodology that was used was also explained that the data from the respondents put in to SPSS software for further analysis. The whole methodology that we used for analysis explained in this chapter. HRM outcomes such as employee skills (competences, including cooperation), employee attitudes (motivation, commitment, satisfaction), and employee behaviors (retention, presence) mediate HRM policies and discretionary behavior (Purcel et al. 2003). After filling the questionnaire from the respondents, the data was prepared in the SPSS. First analysis that has been done was the descriptive statistics. In which the descriptive summary of the data illustrated. The demographics of the respondents also asked in the questionnaire. In which age, gender and qualification of the particular sector includes. The summary of demographics shows that how much participants participate in this activity and the responses of the respondents also involves in the descriptive statistics. The means value shows that how much strong response about the questions gave by the respondents. And maximum and minimum values show that how much people response positive and negative. After the descriptive statistics the second portion of the tests started. That called inferential statistics. In which the Scatter plot, regression and correlation analysis made. Regression test shows the relationship between the variables and multiple regressions was used to check the impact of the independent variable upon the dependent variable and on the other side the correlation explains the relationship of variables. Correlation also explains the predictive statements of the constructs and also shows either acceptance or rejection of hypothesis. According to Gardner, Moyniham, Park and Wright (2001), and Purcell and Hutchinson (2007) argue that in the HRM-performance causal chain it is not HRM outcomes that affect organizational performance, but may exist a serial causation from employee skills, to attitudes and then to behaviors that finally affect organizational performance. Nevertheless, in this study it has been hypothesized and verified that HRM outcomes simultaneously affect organizational performance (Paauwe & Richardson, 1997). Thus, in order to improve organizational performance the levels of satisfaction, commitment and motivation should be improved. Furthermore, in terms of mediation, we found that skills, attitudes, and behavior mediate the relationship between HRM policies and organizational performance. These findings shows that there were be lots of other factors that effect on employee performance but here’s recruitment and selection, reward, training and employee performance has large effect upon the employee performance. That is most probably 80%. Although this study only see the impact of few variables upon the employee performance, yet in future studies it would be useful to include the other variables in the analysis well. Organizations with an innovation strategy afford higher rewards due to their ability to attract the qualified flexible, creative and skilled people necessary for their development. Organizations that follow innovative strategies put emphasis in promotion arrangements, because they have more need of a longer-term orientation of employees (Schuler & Jackson, 1987). With respect to employee relations, organizations that follow an innovation or quality strategy put emphasis in employee participation, involvement and communication, because they need creative and flexible personnel (Sanz-Valee et al., 1999). Moreover, organizations with an innovation strategy put high emphasis on employee participation in order to keep its sophisticated labor force satisfied. Similarly, organizations with a quality strategy pay extensive attention to training and development in order to stimulate co-operation and obtain the continuous improvement that quality implies (Deming, 1986). The primary purpose of the present study was to study the impact of HR practices on organization performance in education sector. For this purpose the present study used quantitative research method to check the proposed model in the context of Pakistan and the present study used population of employees of education sector of Pakistan. The sample size of the study was 150 employees of education sector of Pakistan. The literature review has presented the theoretical evidence from past studies with regard to the link between HR practice and performance. The present study has selected only four HR practices which are both considered being enhanced individual outcomes and performance and when individual outcomes come to enhance it leads to good organizational performance. The four practices of the present study are recruitment and selection, reward and training as well as appraisal system. According to Aycan et al. (2000) Pakistan is highly under-researched area in the field of Human Resource Practices. Still there is lot to do in this area. So the present study is an attempt to enhance and improve and finally contribute towards the literature on HR practices and Performance linkage. In the present study descriptive analysis used to describe the data by using descriptive summary as well as histogram with normal distribution curve. Inferential analysis is also used to check the acceptance or rejection of hypothesis and see the relationship between variables. Using inferential analysis the relationship between compensation, Performance Evaluation, Promotion Practices, and Employee Performance is tested. After observing the descriptive analysis, histograms, scatter plot matrix, and the correlations, the regression has been used for further analysis. After analysis it is found that all the variables that are used in research are statistically significant. The correlation between all variables is significant. 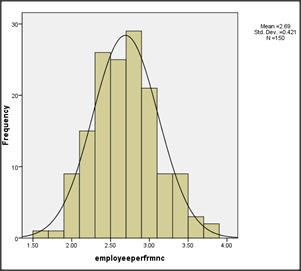 The regression analysis shows the effect size of independent variables on employee and organizational performance which is also significant. Hence this study is done in a developing country with an attempt to analyze the impact of HR practices on employee performance in education sector of Pakistan. The present study helps management and decision makers of banks to improve the employee performance. The main purpose of this study was to help researchers and policy makers in searching the new dimensions to enhance performance of the employees who considered being the main actors in delivering quality services in education sector. In the past many researchers have studied the impact of HR practices on employee and organization performance in manufacturing sector (Huselid, 1995; McDuffie, 1995; Delery and Doty 1996 etc.). But there were very few studies on exploring organizational performance. Therefore the explanation of HR practices and its impact on employee performance in education sector of Pakistan is a highly under researched area in this context. This study has a number of clear implications for both managers and decision makers. Notably, the major implications of the study are as follows. Organizational performance depends heavily on HRM outcomes such as skills, attitudes and behavior. Thus, the emphasis of the development of HRM policies and business strategies should be directed in improving these HRM outcomes. Participation, involvement, compensation, incentives, communication, promotion, training and development, performance appraisal, work design, and selection may constitute in a descending order the important aspects of the HRM strategy. Quality, innovation, and cost may constitute in a descending order the important aspects of the business strategy. Satisfaction, motivation, competence, cooperation with management, cooperation among employees, commitment, Talent Management, retention, and presence may constitute in a descending order the important aspects of the HRM outcomes. This study is specifying that certain high performance HR practices like empowerment, job rotation, employee Participation, Merit based promotions & performance based pay and grievance handling procedures could influence Job satisfaction, employee commitment and employee productivity; it still does not shed light on the mechanisms through which this is accomplished. Future research directions could include: Longitudinal studies to establish the causal relationship between the variables. To enhance external validity, future research attempts should get a representative sample from more organization. Chartman, J. A. (1989). Improving Interactional Organizational Research: A Model of Person Organization Fit. Academy of Management Review, 14(3), 333-349. Daft, R. L., & Weick, K. E. (1994). Toward a Model of Organizations as Interpretation Systems. Academy of Management Review, 9(2), 284-297. Tushman, M. L., & O’Reilly, C. A. (2002). Winning through Innovation: A Practical Guide to Leading Organizational Change and Renewal. Boston, M. A: Harvard Business School Press. Siegal, U., & Sussman, S. W. (2003). Informational Influence in Organization: An Integrated Approach to Knowledge Adoption. Information Systems Research, 14(1), 47-65. Evans, Cheryl A and Redfern, David C. (2010). How can employee engagement be improved at the RRH Group? Part 1. Industrial and Commercial training.42 (5).pp.265-269. Milkovich, G. F and Newman, J.M.(2001). Compensation Approach. Boston: Irwin, 508p. Amos, T., Ristow, A. & Ristow, L. (2004). Human Resource Management (2nd Ed. ).Lansdowne: Juta. Brotherton, B. (2003). The international hospitality industry: Structure, characteristics and issues. Burlington, MA: Butterworth-Heinemann. Brown, D. (2003). Reward strategies, Journal of personnel management, 1; 17-29. B.Lund, Daulatarm (2003).Organizational Culture and Job Satisfaction. Journal Of Business & Industrial Marketing.18(3).219-236. Bernadin, H.J. (2007). Human resource management: An exponential approach. 4th ed. New York: McGraw-Hill Irwin. P. 253-277. Chenhall, R.H., & Langfield-Smith, K. (2007). Multiple perspectives of performance measures’ European Management Journal, 25, 266-282. Fisk, D. (2001) In Switzer, T. R (2004) Simmons-Welburn, J., & McNeil, B. (Eds.). (2004). Human resource management in today’s academic library: Meeting challenges and creating opportunities. Westport: Libraries Unlimited. Grinstein, Yaniv & Hribar, Pual (2004). 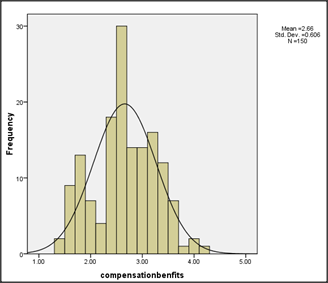 “CEO compensation and incentives: Evidence from M&A bonuses”. Journal of Financial Economics, Vol. 73 No. 1, p. 119-143. Gürhan Uysal, G. K. (2009). 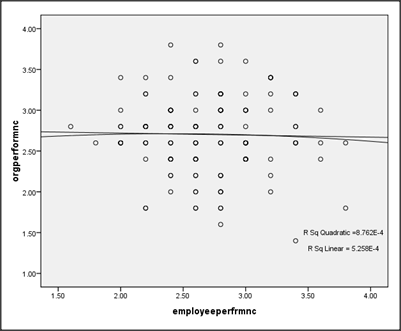 HR and firm performance at companies in Turkey: Correlative analysis. Journal of Modern Accounting and Auditing , 45-48. Huselid, M.A. (1995). The impact of human resource management practices on turnover, productivity, and corporate financial performance. Academy of Management Journal, 38 (3), 635-72. Judge, T.A., Thoresen, C.J., Bono, J.E., & Patton, G.K. (2001). The job satisfaction-job performance relationship: A qualitative and quantitative review. Psychological Bulletin, 127(3): 376-407. Loomis, K. (2008).Reward Management, Journal of Industrial Relation, 21:5-12. Khan, M.A (2010). Effects of Human Resource practices on organizational performance. An empirical study of Oil and Gas industry in Pakistani. European Journal of Economics Finance and Administrative Sciences, 24, 158-175. Lawler, E. (1992). The Ultimate Advantage: Creating the High-Involvement Organization, (1st ed.). San Francisco: CA. MacDuffie, J.P. (1995). Human resource bundles and manufacturing performance: organizational logic and flexible production systems in the world auto industry. Industrial and Labor Relations Review, 48 (2), 197-221. Mullins, L.J. (2010). Management and organizational behavior, (9th ed.). Harlow: Pearsons education Limited. Tessema, M. & Soeters, J. (2006). Challenges and prospects of HRM in developing countries: testing the HRM performance link in Eritrean civil service. International Journal of Human Resource Management, 17(1), 86-105. Torrington, D., Hall, L. & Taylor, S. (2008). Human Resource Management, (7th ed.). Harlow:Prentice Hall. Uysal, G., & Koca, G. (2009). HR and firms performance at companies in Turkey. A corrective analysis. Journal of Modern Accounting and editing, 5(1), 45-48. Wall, T. & Wood, S. (2005). The romance of human resource management and business performance, and the case of the big science. Human Relations, 58 (4), 429 62. Appelbaum, E., Bailey, T., Berg, P., & Kalleberg, A.L.(2000). ‘Manufacturing advantage: Why high-performance work systems pay off’. London: Economic Policy Institute: Cornell University Press. Armstrong, M. (1996). A handbook of personnel management practice. London: Kogan Page.Sigler, Kevin J. (1999). Challenges of Employee Retention. Management Research News. 22(10). Smitt, Raoul et al (2002). Belöningssystem – nyckeln till framgång .Stockholm: Nordstedts Juridik AB. Werther, W. B., Davis, K., Human resources and personnel management. New York: McGraw-Hill, Inc., 1996. The aim of following survey is to examine the impact of human resource practices on organization performance. This survey has been conducted by the student of Superior University, Lahore. This questionnaire is design to gain knowledge about how these human resource practices affect employee performance and how employee performance affects the organization performance. Note: please rank the facilities and services in this using following scale. 1 My organization places the right person in the right job. 3 Adequate and relevant information about the organization and job is provided to the candidate at the time of recruitment. 6 The training needs of the employees in our organization are Assessed on the basis of their performance appraisal. 7 Training in our organization includes social skills, general problem solving skills and broader knowledge of the organization and business. 8 The contents of the training programs organized are always relevant to the changing needs of our jobs and our business. 9 Our organization recognizes the career growth needs of its employees. 11 Our organization appraises the performance of its employees at regular intervals. 13 Performance appraisal at our organization undertakes to identify the developmental needs of its employees to help them attain their career goals. 14 I receive proper feedback on how we are performing. 12 We are being paid adequately for the work we do. 13 Pay increments offered by our organization are satisfactory. 14 Our organization makes all payments due to us in time. 15 The benefits we receive in our organization are similar to what most of the other organizations in the industry provide to their employees. 16 The existing reward and incentive plans do not motivate us for better performance. 17 Our organization provides programs to assist balancing demands of families with children and/or elderly family members. 18 Our organization is a recommendable place to work. 19 Continuous efforts are made in our organization to create a sense of belonging among employees and feel like a member of the corporate family. 20 Rewards in our organization are strictly linked to employee performance. 21 Rewards and incentives are fairly distributed in our organization. 23 In my organization good performers get promoted first. Sir, please share this complete article with me, I’ve too much need of that article. Can you please provide the source from which questionnare was adopted? Its a self-made questionnaire developed with the help of teacher. Could you please provide your questionnaire and references to go in detail of some related research purpose. The article uploaded is final. Please take help from the given data in the article. Please unlock the the whole paper by sharing it on any of the given social media platform. please share this complete article with me, I’m so in need of it becouse i’m doing my thesis.